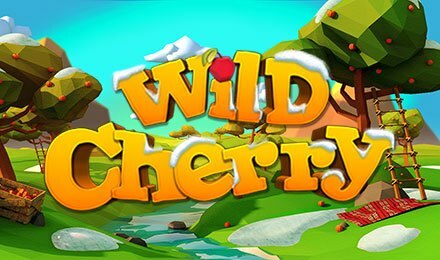 Themed on the very popular fruit theme, Wild Cherry slots is a 5 reels and 40-lines video game, that incorporates wonderful cartoon graphics and features like Expanding Wilds, Free Spins, Wheel Of Fortune and much more! On the wonderful sunny background, where the blue sky reigns the top and the green trees takes over the setting on the grid, you will find symbols like: Kiwis, Plums, Bananas, Watermelons, Lemons, A, K, Q, J and 10 landing on your reels. Before you start spinning the reels of Wild Cherry slot, set your bets using the plus or minus buttons and then start your gameplay. You could also play the game using the Autoplay option, which allows you to set from 5, 10, 15, 25 and 50 auto spins to put to play. Amount of Paylines Selection: All 40 Paylines remain fixed. Coin Values: Set your coin values from £0.40, £0.80, £2.00, £4.00, £10.0 and £20.00. Whenever the watermelon 3x2 is completely visible on the last row, it will crush and become a 1x3 symbol. It will shoot out four or more watermelon slices to random places on the reels. Whenever a lemon lands on the row of juice palms, a cash reward of 1x, 2x or 3x is randomly awarded. When a fully visible orange bonus symbol appears anywhere on the reels, a spin on the Wheel of Fortune is awarded. The following rewards can be won: 200x, 50x, 25x, 10x, 5x, 10 free spins, 15 free spins, 20 free spins or 10x and respin on the Wheel of Fortune. Free spins can be retriggered by landing additional free spins symbols during the play of the feature.